Superheroes may reign at the multiplex, but the Lord of the Apes is hoping to reclaim the crown. We find John Clayton III a.k.a. Tarzan (Skarsgård) living a life of aristocracy in London, alongside his American wife Jane Porter (Robbie). It has been years since Tarzan has left the jungle and now, King Leopold II of Belgium has invited him to return to the Congo Free State. Tarzan is initially reluctant to travel back to Africa, but is convinced by George Washington Williams (Jackson), an American diplomat who plans to investigate Leopold’s alleged use of slaves to build a railway through the Congo. Tarzan is unaware that he is being lured back to the jungle by the ruthless and avaricious Belgian Captain Léon Rom (Waltz), who has offered to deliver Tarzan to the vengeful Chief Mbonga (Hounsou) in exchange for diamonds. As Tarzan reunites with the various wild animals he grew up amongst, the people of the Congo must fight for their liberty. Edgar Rice Burroughs’ Tarzan is an enduring figure in popular culture, but is now most often viewed as kitschy and campy. Clad in a loin cloth, yelling as he swings through the trees – he’s not exactly the action hero modern-day moviegoers have become accustomed to. Director David Yates, best known for helming the final four instalments in the Harry Potter film series, endeavours for viewers to take Tarzan seriously again. This take on the story is commendable in that it wants to be about something, directly addressing the colonialist politics and the unethical means by which various European nations went about their conquest of Africa. It’s pretty heady stuff and the film’s approach errs on the simplistic side, but there’s enough action to ensure the film doesn’t get bogged down in its sombre themes. Yates, working from a screenplay by Craig Brewer and Adam Cozad, approaches this as a work of historical fiction. The primary antagonist, Léon Rom, is an actual historical figure, who was known for keeping severed heads in his flowerbed. In addition, George Washington Williams as depicted in the film is a fictionalisation of a real-life Civil War veteran, preacher, politician, lawyer, journalist and historian. The 1890 setting is established with enough detail, but one does occasionally get the sense that this is an adventure flick putting on stuffy period drama airs. Skarsgård beat out the likes of Henry Cavill, Tom Hardy, Charlie Hunnam and swimmer Michael Phelps, who was toying with using this film to launch an acting career, for the title role. 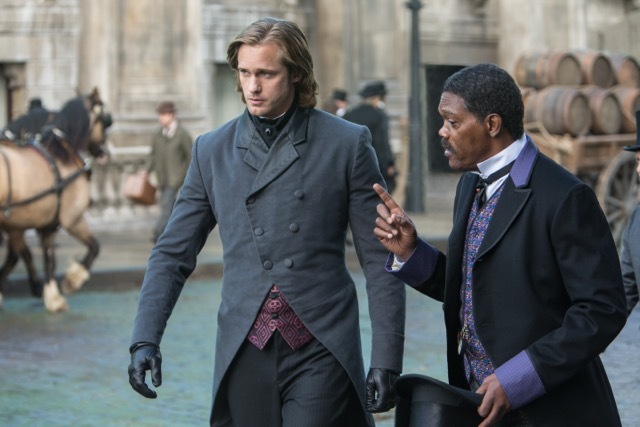 We first see Tarzan as John Clayton III, trying to fit in among the upper crust, and Skarsgård ably conveys that this is a man who is not in his element. While Tarzan is traditionally viewed as a feral man, this version portrays him as a person of both instinct and intellect, having mastered multiple languages and well-versed in various cultures. He wants to be seen as more than a mere oddity. Naturally, we get to see him doff his shirt, and any doubts that he wouldn’t be able to pull off the necessary muscled physique are quickly assuaged. For all his efforts, Skarsgård is still encumbered by a certain stiffness, and this reviewer would like to have seen a more passionate, unbridled Tarzan. Yates wanted Jessica Chastain to portray Jane and the studio had their eyes on Emma Stone, but it’s Robbie who portrays Tarzan’s lady love. Robbie possesses an irrepressible radiance and imbues Jane with a charming vigour. 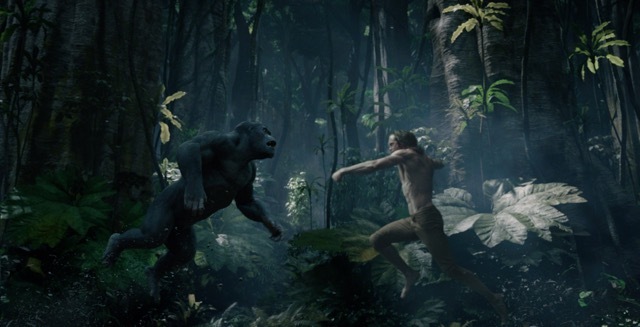 The film is able to strike a balance between putting Jane in peril, as she is expected to be so Tarzan can rescue her, while also making her a capable character in her own right. She holds her own opposite Waltz, but the scene in which Jane grits her teeth to sit down for dinner with Rom is a pale imitation of the similar scene between Belloq and Marion Ravenwood in Raiders of the Lost Ark. There’s no denying Waltz is a talented actor, but by now, audiences have begun to tire of seeing him typecast as the villain, and he does nothing different as Rom. 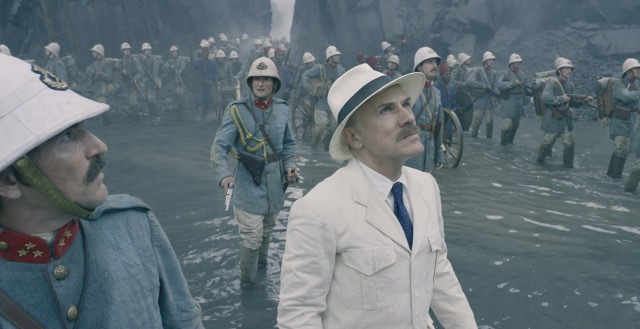 The character is the embodiment of imperialist greed, striding through the jungle with fearsome troops behind him, taking what he wants at will. There’s no nuance here, and Waltz often seems extremely close to twirling his moustache. 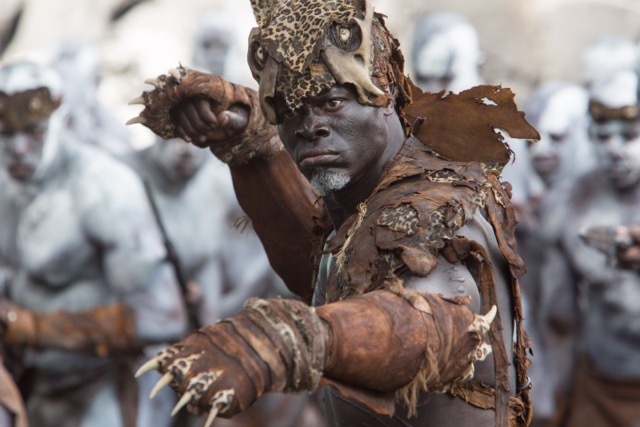 Hounsou strikes an imposing presence as the tribal leader who has a long-standing vendetta with Tarzan, but gets too little screen time for their conflict to take hold. Jackson is entertaining as Williams and the character gets a moment to reflect on his own history and explain his motivations. However, his performance can’t help but come off as anachronistic, and Williams is very much a wise-cracking buddy cop sidekick, which can pull one out of it at times. There is a great deal of visual effects work and a multitude of computer-generated animals required to populate the Congo. Unfortunately, some of these beasts look sillier than others, and several sequences, particularly a railroad ambush and an ostrich stampede, lack polish. Tarzan calls on his animal friends for assistance during the climax, and for a film purported to be a more serious telling of the Tarzan tale, it is a little goofy. 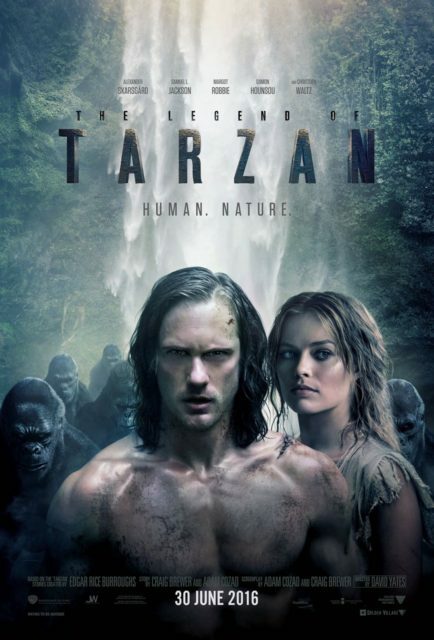 The world was never aching for another Tarzan movie, but this one justifies its existence by incorporating historical elements and setting out to make a statement about man’s relationship with nature. This is complemented by a blend of National Geographic-style panoramic vistas and moderately exciting action beats. While it lacks the heart of the animated version the target teen audience might be most familiar with, it’s a fine addition to the Tarzan movie canon, and definitely ranks far above the risible 2014 animated take. Summary: Historical elements are cleverly weaved into the familiar Tarzan tale and this is not as much of a re-tread as one might expect, but there’s still a certain vitality missing from this version. The most dangerous game has just gotten dangerous-er. In the aftermath of the Chromosyndrome-4 virus outbreak, the world is reeling from a war between the living and the infected undead. Entrepreneur Valerie Wilton (Goose) has established a game reserve called ‘The Rezort’, an island getaway where paying guests can hunt and kill zombies for sport. 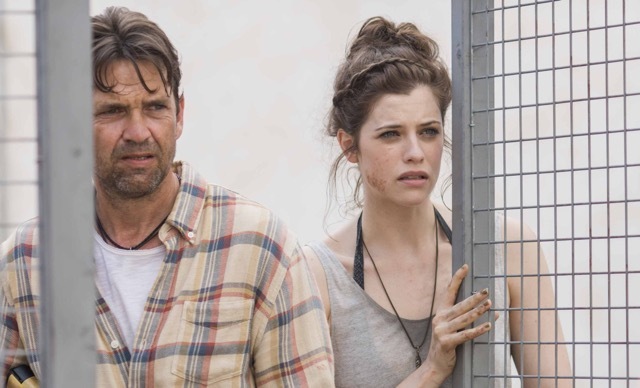 Melanie (De Gouw), a young woman whose father died in the zombie war, goes to the Rezort with her war veteran boyfriend Lewis (McCann) in search of catharsis. Joining them in the tour group are enigmatic sharpshooter Archer (Scott), gamer teenagers Alfie (Walker) and Jack (Ahluwalia) and Sadie (Rhys), who was supposed to go on the trip with her fiancé before he left her. All hell breaks loose as a glitch in the security system allows the zombies to overrun the island. Director Steve Barker is no stranger to the zombie movie subgenre, having made Outpost and its sequel Outpost: Black Sun, featuring Nazi zombies. The influences on The Rezort are readily apparent: in addition to the obvious parallels with The Most Dangerous Game, this is best described as “Jurassic Park with zombies instead of dinosaurs”. John Hammond’s catchphrase in Jurassic Park was “we spared no expense” – given the limited resources director Barker had at hand vis-à-vis the relatively ambitious scope of The Rezort, the production values are surprisingly decent. The concept is realised with enough thought behind it and the Rezort has a nicely developed corporate identity within the story. This is a B-movie through and through, but it’s certainly not a bad premise. Paul Gerstenberger’s screenplay takes stabs at confronting the ethical quandary of hunting what once were human beings, and there’s a half-baked refugee allegory somewhere in there too. It’s not lofty philosophy by any means, but it’s more than we expected from an action-horror romp. Unfortunately, it takes too long for the movie to kick into gear, and once everything goes pear-shaped, the zombie mayhem is largely repetitive and not terribly exciting. It’s the same thing a lot of zombie flicks struggle with – the undead hordes chomp down on their victims or rip out their throats, the human survivors blast a zombie in the head, repeat ad nauseam. It certainly doesn’t help that all the acting is patently unremarkable. Some might recognise De Gouw from the recent DraculaTV series or her stint as the Huntress on Arrow; she’s little more than a generically pretty brunette and does not possess much screen presence. It’s also a bad sign when the mysterious badass in your cast is played by Dougray Scott, who probably still rues the day he had to drop out of X-Men and was replaced by Hugh Jackman. The two jumped-up teenage gamer characters are supremely annoying, but that was likely the intention. Goose is pretty flat in the stock icy boss lady role, which really could’ve been a lot of fun in the hands of someone like Cate Blanchett or Glenn Close. 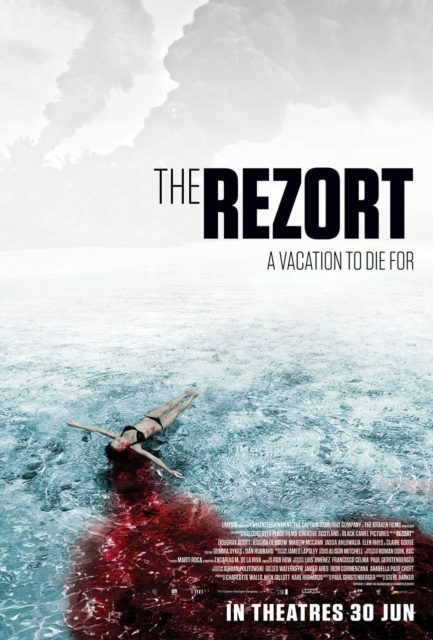 If you’re a genre aficionado and enjoy seeking out low-to-mid-budget horror flicks that fly under the mainstream radar, The Rezort is worth a passing glance for putting a somewhat inspired spin on the zombie movie formula. It’s plenty silly, but does not get swallowed up entirely in said silliness and with a better cast and a bigger budget, might actually have been almost good. Summary: The Rezort lacks in thrills and its ambition is hamstrung by its budget, but there are glimmers of wit in its premise, such that it rises slightly above your run of the mill zombie flick. There was a meme going around a while back, of a framed photograph atop an altar of Ewan McGregor as Obi-Wan Kenobi in Attack of the Clones, the idea being that some old lady thought it was a picture of Jesus Christ. Here, McGregor actually plays Jesus, referred to as “Yeshua”. 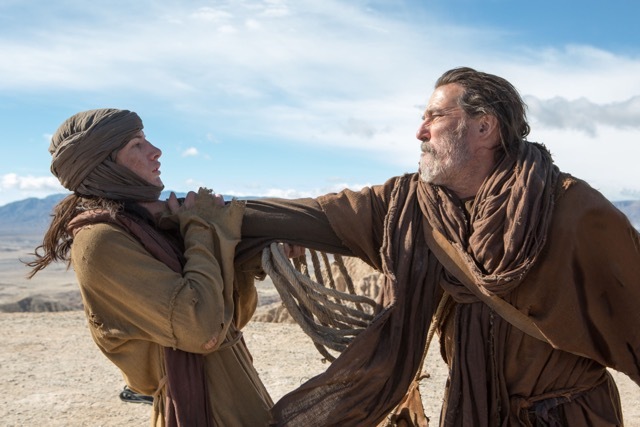 This film imagines an incident during Jesus’ sojourn to the desert, during which He was tempted by the Devil (also McGregor). Jesus comes across a family living in the desert, comprising an unnamed Father (Hinds), a sickly Mother (Zurer) and their son (Sheridan). The Devil poses a challenge to Jesus, wagering that the Son of God will not be able to find a solution that will please each member of the family. Jesus stays as a guest of the family, helping them out with a construction project, while wrestling with the Devil, Father God seemingly millions of miles away. Writer-director Rodrigo García has repeatedly clarified that this not your run of the mill Biblical epic, and is instead an intimate drama and character study. 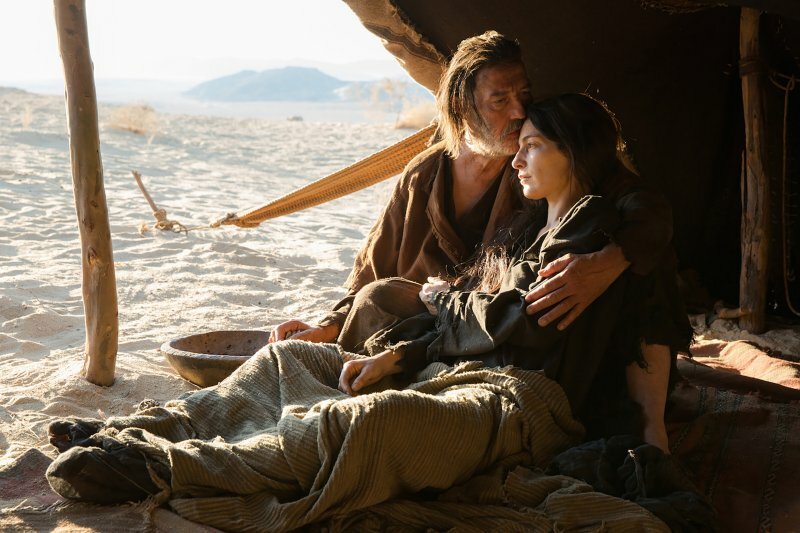 The story of Jesus’ temptation in the desert is told in three of the four gospels, and Christians will be familiar with how Jesus refuted each of Satan’s challenges to Him by quoting from the scripture. This film departs from tradition, but also does not feel like it’s courting controversy for the, uh, hell of it. García explained his decision to refer to Jesus as “Yeshua”, which is the original pronunciation, in an interview with Christianity Today. “I wrote a few pages in which I called Him ‘Jesus’, but when you’re writing a screenplay and it says ‘Jesus walks, Jesus says,’ after a while, the weight of the name is paralyzing,” García said. There are individual elements to García’s approach that are intriguing, but as a whole, the film often comes off as aimless and meandering. If it was his intention to make the audience feel like they’re spending 40 days and 40 nights in the wilderness alongside Jesus, then García has succeeded. All things considered, the 108-minute running time is not particularly long, but even then, this feels interminable at times. It seems like three or four good ideas are spaced out, with a vast void in between. The Oscar-winning Emmanuel “Chivo” Lubezki is the cinematographer here, but it is a dull movie to look at, the desolate surroundings about as dull as one imagines the average desert to look. The film was shot on location in the Anza-Borrego Desert State Park in the Colorado Desert of Southern California, and it might sound silly, but for this reviewer at least, the knowledge that this was filmed in the United States did rob the movie of some authenticity. 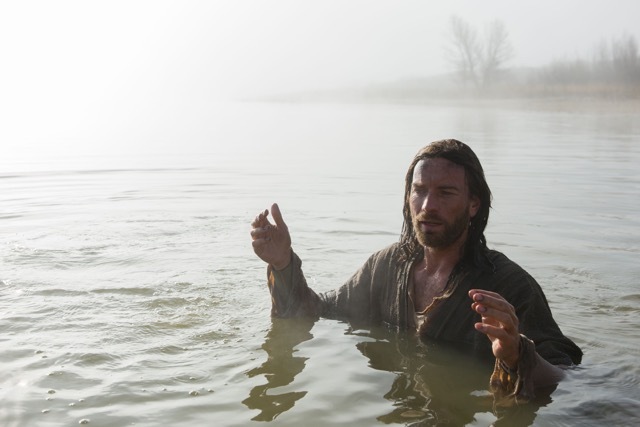 Speaking of authenticity, this is yet another Hollywood film in which a white man is cast as Jesus. 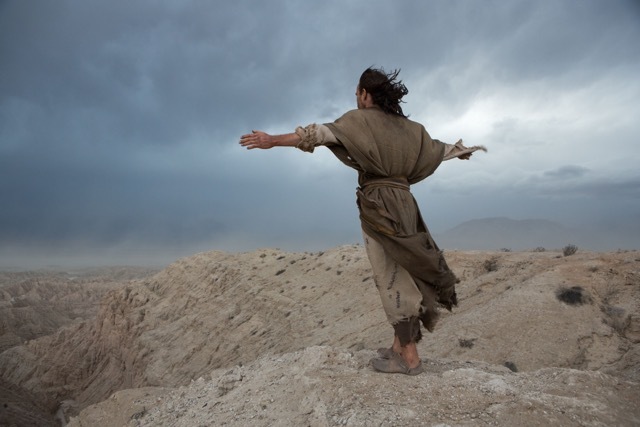 We don’t want to harp about issues of race and sure, there’s always room for poetic license, but especially with an actor who feels as contemporary as Tye Sheridan running about, it’s very hard to take this very seriously as a film set in Ancient Israel. That said, McGregor does face the myriad challenges in portraying the iconic religious figure head-on. There’s enough of a humanity to Jesus and at one point, He even laughs at a fart joke, but McGregor’s portrayal does have an undercurrent of reverence to it. One of the smartest ideas on display is that of having McGregor play the dual roles of Jesus and His tormentor Satan. A conversation they have about the nature of God is the closest the film gets to any real theological insight. For a movie that wants so much to depart from tradition though, it seems a cliché that Satan wears jewellery as a way to differentiate him from Jesus; that the bad guy has to be coded as flamboyant. The visual effects work in duplicating McGregor is seamless and one does forget that there aren’t two Ewan McGregors after a while. On one level, this is a family drama, with the parents and their child working out their issues while a house guest is present. Hinds’ Father is a realist, a practical man who has his doubts about issues of faith, but does not dismiss the holy man outright. The struggles of a father in understanding his son are very relatable. Sheridan shares some genuinely affecting moments in which the son bonds with Jesus, but as alluded to earlier, he’s ultimately too American to be believable in this setting. The mother is ill for most of the film, so Zurer has less to do compared to Hinds and Sheridan, but the character’s pain still resonates. 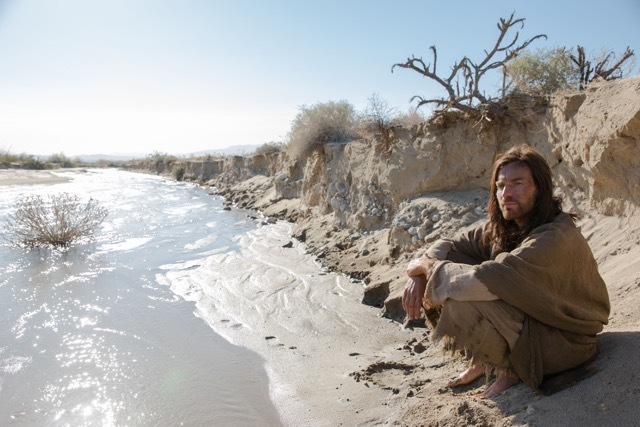 Last Days in the Desert feels more like a filmmaking experiment than a well-told story, but García is largely able to strike a balance between portraying Jesus’ humanity and deity without getting caught up in that, or blazing down a blasphemous path Last Temptation of the Christ-style. Alas, it is likely that this will induce thumb-twiddling rather than soul-searching. 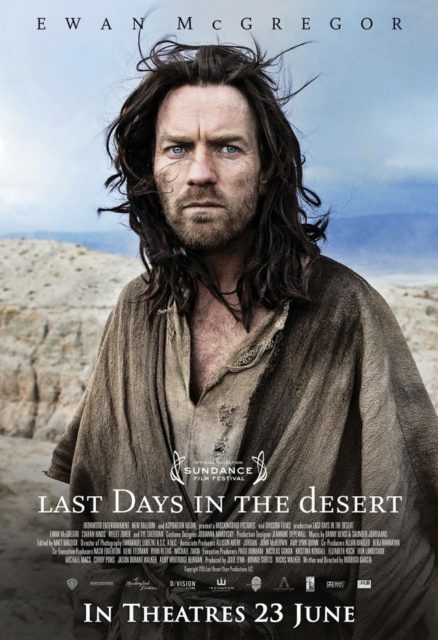 Summary: Ewan McGregor shines in his dual role, but Last Days in the Desert’s loose structure and lack of narrative drive keep its audience at a distance. Over the past few years, Kevin Hart has become the universal adapter plug of the buddy comedy subgenre, having been paired with the likes of Will Ferrell, Josh Gad and Ice Cube amongst others. This time, Hart is teamed with Dwayne “The Rock” Johnson. But is just their disparity in physical stature enough to elicit the laughs? Hart plays Calvin “Golden Jet” Joyner, who in high school, was a popular and highly successful student. Robbie Weirdicht (Johnson) was an overweight social outcast who was relentlessly bullied, and Calvin was the only one who would show him any kindness. 20 years later, Robbie has undergone a complete physical transformation and reinvented himself as “Bob Stone”. Calvin is married to his high school sweetheart Maggie (Nicolet), but is unfulfilled in his accounting career. Robbie and Calvin reunite, but Calvin is informed by CIA agent Pamela Harris (Ryan) that Robbie is in fact a dangerous rogue agency operative wanted for the murder of his former partner. Robbie tries to convince Calvin of his innocence as the two go on the run, trying to stop classified intel from falling into the hands of a mysterious underworld player known as “the Black Badger”. 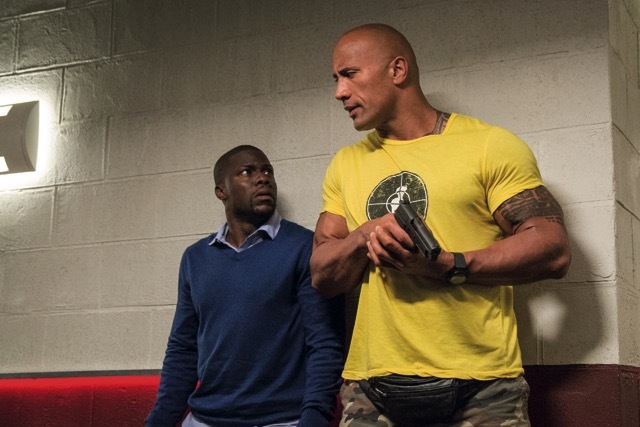 The thinking behind Central Intelligence seems to have been “just let the two leads loose, that should be plenty to carry a movie.” Much of the would-be comedy is painfully unfunny, and the action is generic and unimpressive. This is far from the first comedy in which a regular Joe is flung into the mix of high-stakes international intrigue, and the plot is painfully perfunctory and the final reveal is a predictable one. There’s an anti-bullying message here, that if you’re picked on by the jocks in high school, all you need to do is transform yourself into Dwayne “The Rock” Johnson to get back at them. That should be pretty easy for anyone to do. The prologue features Johnson’s face digitally pasted onto Sione Kelepi who portrays the young Robbie; this effect is nestled deep in the uncanny valley and is terrifying rather than funny. To the movie’s credit, it doesn’t go down the “one’s silly and the other’s stoic” route typical of buddy cop flicks. While Hart does eventually go into shrill, flailing mode, the character is likeable because of the kindness he shows towards the underdog. Johnson does have fun with the Robbie character, who may be all 6’ 5” of hulking muscle, but is the same awkward, socially mal-adjusted kid deep down. The thing is, Johnson is too slick and polished to come across as convincingly dorky. Nicolet’s Maggie is just “the wife” – the plot seems to hint at how marrying one’s high school sweetheart may not be all it’s cracked up to be, but doesn’t really go anywhere. Ryan is certainly far above the material, and phones it in as the comically serious dogged agent hunting down the suspect. Bateman is pretty much wasted as a stock slimy, snivelling banker type, and Paul’s appearance amounts to little more than an extended cameo. Look out for a prominent comedienne in the film’s climax. 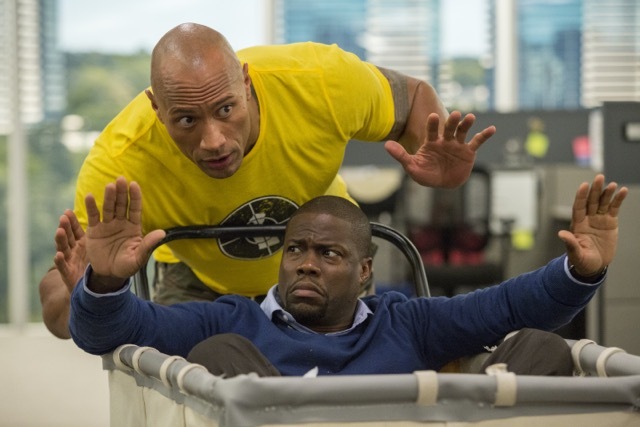 Central Intelligence has the same problem that most Kevin Hart vehicles have: the producers bank too much on the comedian’s appeal to audiences and everything around him seems to be on autopilot. It’s a wasted opportunity, especially since Hart is paired with a bona fide action hero like Johnson. 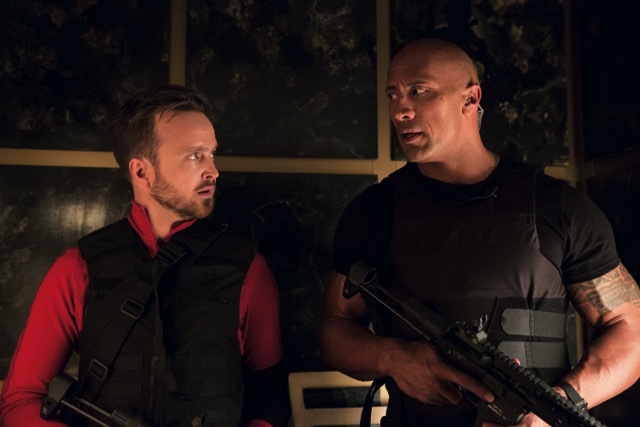 Instead of a production line comedy with bits of action sprinkled about half-heartedly, it would have been fun to see the duo tear into the conventions of buddy cop and spy movies in a full-tilt action extravaganza fuelled by belly laughs. The film trucks out the hoary dictum of “being yourself” – we’ll bet it’s easy to “be yourself” when you’re Dwayne Johnson. The scenes in which Robbie is wracked with anxiety brought about by the trauma he endured in school did resonate a little with this reviewer, but it never seems sincere enough to be a truly effective message. 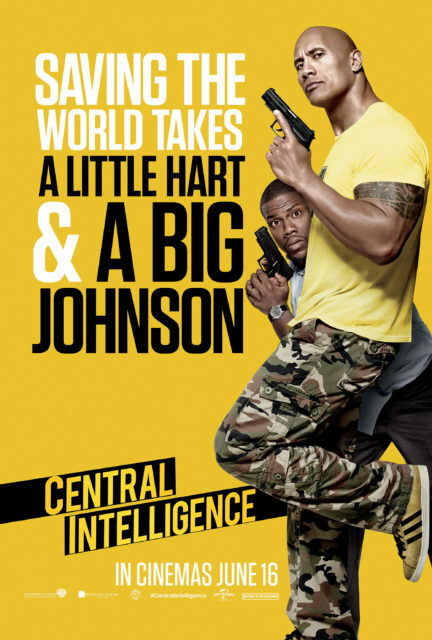 Sure, it’s sporadically amusing just by dint of putting Hart and Johnson together, but it’s clear that Central Intelligence isn’t aiming for any particular heights and is merely coasting along. Summary: Sure, the leading men have chemistry, but unremarkable action sequences and jokes that are more cringe-inducing than genuinely funny ensure this won’t be front and centre in most moviegoers’ memories after they leave the theatre. Pixar beckons us back fathoms below in the sequel to Finding Nemo. 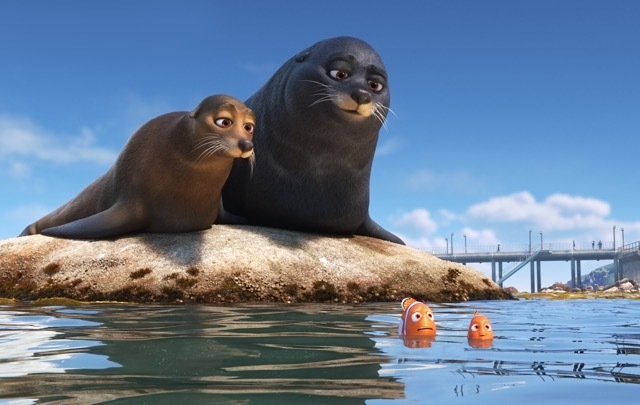 In real life, it’s been 13 years since the first film, but our story picks up a year after the events of Finding Nemo. 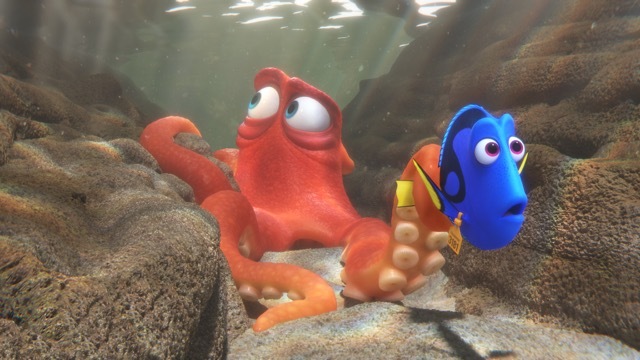 Dory (DeGeneres), the blue tang stricken with acute short-term memory loss, begins to have flashbacks to her childhood, hitherto entirely forgotten. 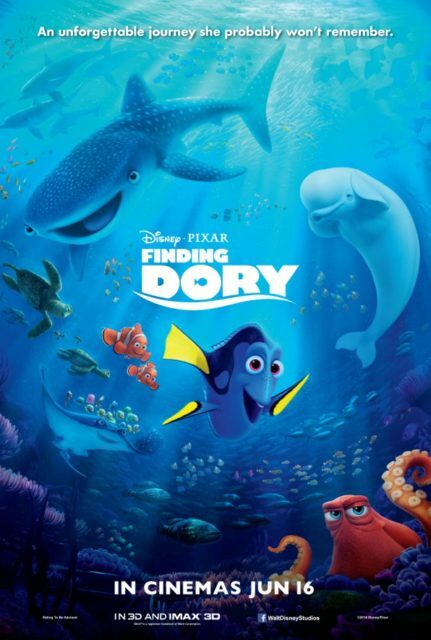 Dory recalls her parents Charlie (Levy) and Jenny (Keaton), and sets out on a quest to track them down. Dory’s friends, the clownfish Marlin (Brooks) and his son Nemo (Rolence), accompany her from the Great Barrier Reef to the Marine Life Institute in California. There, they become acquainted with the cantankerous ‘septopus’ (he’s lost an arm) named Hank (O’Neill); Destiny (Olson), a near-sighted whale shark who was Dory’s childhood friend; Bailey (Burrell), a beluga whale with self-confidence issue, and the sea lions Fluke (Elba) and Rudder (West). While Marlin wants nothing more than to stay home, he has to brave the unexpected yet again so his friend can be reunited with her family. Over the years, DeGeneres has relentlessly lobbied for a Finding Nemo sequel on her talk show. Not only has she gotten her wish, Dory has been bumped up to the main character. In addition to voice actors DeGeneres and Brooks, director Andrew Stanton has returned. Stanton also co-wrote the screenplay with Victoria Strouse, with Bob Peterson and Stanton receiving a “story by” credit. There was always the danger of this being a mere retread of the first film, now considered a classic of contemporary animation. 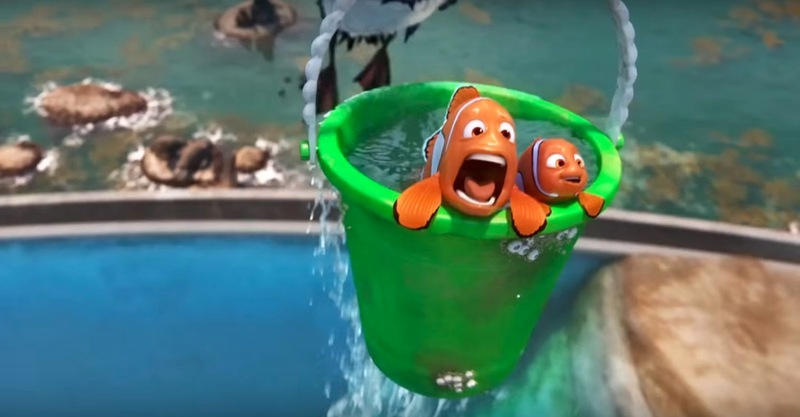 While it does cover some of the same territory and doesn’t arrive at the same purity of emotion that Finding Nemo did, the sequel is still packed with heart and offers entertainment by the tank-full. Sequels have a tendency to lose sight of what made the first film work in their pursuit of being “bigger and better”. 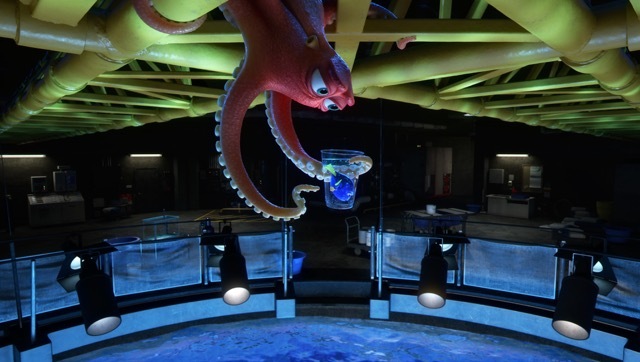 Finding Dory is actually smaller in scope than the first film, with most of the action taking place within the Marine Life Institute, modelled on the famous Monterey Bay Aquarium. As we’ve come to expect from the studio, the animation is awe-inspiring and suffused with life, the environments spilling over with realistic detail. The animators have a lot of fun guiding Dory through the various mini-environments within the Marine Life Institute and the action sequences have a dynamic theme park ride feel about them. Like its predecessor, it’s still a road movie: our heroes meet weird and wonderful personalities as they journey far from home in search of something, or someone. The story possesses a crucial forward momentum: there’s never a dull moment and the characters get from point A to point B in increasingly inventive ways. Not only is it fast-paced, it’s also frequently funny, with many jokes eliciting guffaws from this reviewer. A well-known actor who has appeared in a Pixar film before gets a riotous vocal cameo. This reviewer was worried that Dory would be the latest victim of what we call “breakout character-itis”, wherein a supporting character becomes such a hit with audiences that their screen-time is massively increased in the sequel, sometimes to the film’s detriment. Dory’s appeal remains untarnished – much comedy is derived from the character’s ailment, but the film also recognises it as a source of profound tragedy, and this becomes the driving force in the plot. Dory’s back-story is established from the outset, and while it doesn’t quite tug on the heartstrings the way Nemo and Marlin’s bond did in the first one, there will still be no shortage of tears. Keaton and Levy bring understated warmth to the roles of Dory’s long-lost parents. Marlin and Nemo receive just the right amount of character development: while they’ve both learned from their harrowing adventure, the essence of who they are remains unchanged. 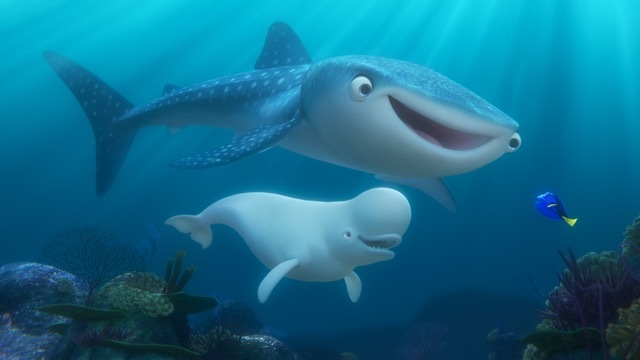 The pragmatism and impatience that Brooks brings to his performances ensure that Marlin remains an excellent example of the “comically serious” trope, while Rolence is as ideal a replacement for original Nemo voice actor Alexander Gould as any imaginable. Gould, now 22, has a vocal cameo. O’Neill can play the curmudgeon in his sleep, and Hank is eminently endearing despite, or perhaps because of, his crankiness. Hank is the focus of many clever visual gags that make playful use of an octopus’ ability to contort itself and change its skin colour with the help of chromatophores to blend seamlessly into the background. Some of the other new characters, while often amusing, are not quite so memorable, and each of them have an obvious hook which seems like something a lesser animated film might fall back on. It’s always great to hear Elba’s distinct baritone, but he was better in Zootopia earlier this year. Finding Dory isn’t as good as Finding Nemo, but considering the stratospheric watermark that film set, it’s to be expected. This film reunites us with the characters we love, just as we remember them, plunged into zany new scenarios. Pixar knows how to reel an audience in, and there’s so much here to hook on to. The short film preceding the feature, Piper, is an exercise in straightforward storytelling, starring a particularly adorable feathered hero and boasting some of the most sublime computer-generated animation this reviewer has ever seen. Oh, stick around for a post-credits stinger! Summary: Seek and ye shall find all those Pixar hallmarks: beautiful animation, humour, moving sentiment and family-friendly thrills. It’s not as profound as some of the studio’s other work, but it’s so entertaining that its shortcomings are easy to forgive. 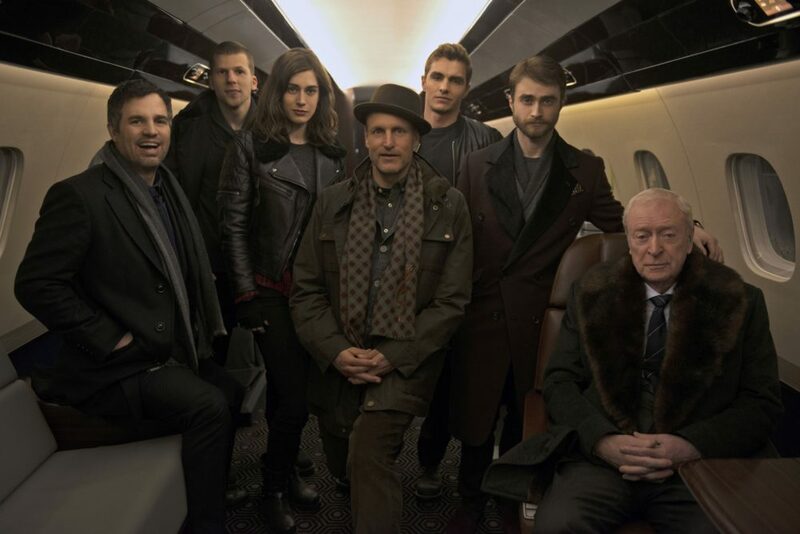 The Four Horsemen ride again with new tricks up their respective sleeves in the sequel to Now You See Me. It’s been a year since the events of the first film, and Daniel Atlas (Eisenberg), Merritt McKinney (Harrelson) and Jack Wilder (Franco) have been lying low, awaiting instructions from The Eye, the secret society into which they were inducted. FBI Agent Dylan Rhodes (Ruffalo) attempts to keep up the charade of pursuing the Horsemen while secretly leading them. Replacing Henley Reeves, who grew tired of waiting, is the enthusiastic Lula (Caplan). The Horsemen’s new mission is to expose the unethical practices of smartphone manufacturer Octa, but a spanner is thrown in the works by Walter Mabry (Radcliffe), Octa’s reclusive co-founder. The Horsemen find themselves in Macau, and must seek the help of magic shop proprietor Li (Chou) as Mabry forces them to pull off a nigh-impossible heist. In the meantime, both former benefactor Arthur Tressler (Caine) and magic debunker Thaddeus Bradley (Freeman) seek their vengeance on the Horsemen. Jon M. Chu replaces Louis Leterrier in the director’s chair for the second instalment of what studio Lionsgate is hoping shapes up to be their next big franchise. 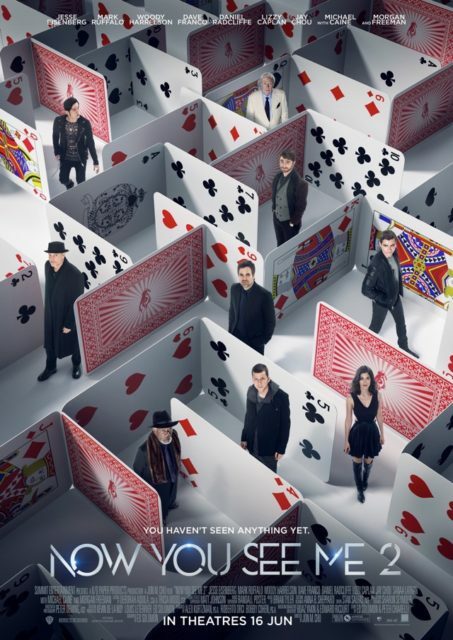 If the first film offered up flashy spectacle and a plot comprised of puzzle pieces that did not quite fit together in hindsight, Now You See Me 2 gives audiences more of the same. The screenplay by Ed Solomon ties itself into knots that do not untangle despite giving the appearance of doing so. This might seem like a film that imagines itself to be far smarter than it really is, but the more likely scenario is that the filmmakers are well aware that these movies will not hold up to scrutiny and that audiences will be content with revelling in the moment. Chu brings slickness and swagger to the proceedings that ever so slightly papers over the gaping plot holes. The director’s dance movie expertise is evident in several sequences that are elaborately choreographed, but ultimately more dizzying than dazzling. The first film’s greatest asset was its cast, comprising actors whose charisma and charm could almost rival that of Danny Ocean and his 11, if only the Four Horsemen weren’t outnumbered. Isla Fisher was unable to reprise the role of Henley Reeves due to her pregnancy, so Henley was written out and Lizzy Caplan steps in as new character Lula. The danger with these characters is that being showmen, they’re all egotistical and obnoxious to different degrees. Harrelson seems to be having twice as much fun as before, but comes across as irritating rather than actually funny. Atlas’ haughty, twitchy nature is something Eisenberg has no problems conveying, but Atlas has had to eat some humble pie since the events of the last film, and Eisenberg convincingly portrays that character development too. Caplan is a likeable performer, but her “over-eager new girl” shtick does also wear on the nerves after a while. Rhodes’ charade is up and the audience knows that he is not only on the Horsemen’s side, but actively leading them. 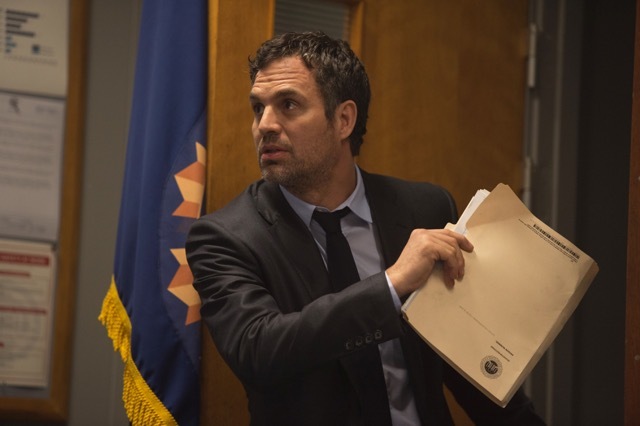 Ruffalo gives the role far more effort than it deserves, and his presence does elevate the material. Quite amusingly, Ruffalo becomes the latest Hollywood actor who has to pretend to be adept at speaking Mandarin Chinese. 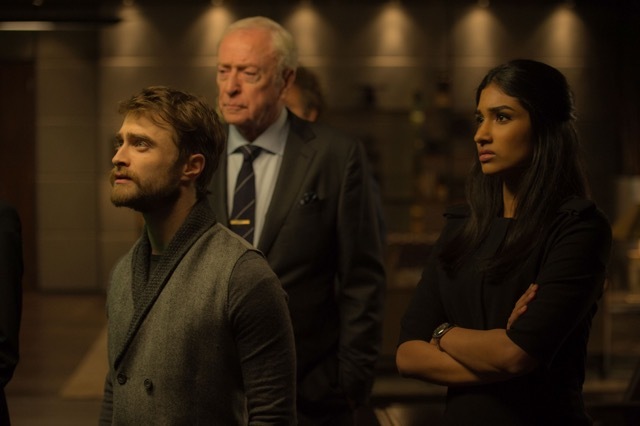 As the primary antagonist, Radcliffe isn’t exactly easy to buy as someone who would be able to run rings around the Horsemen. The actor has explored his darker side in other film and stage projects, but there’s supposed to be menace behind Walter’s smile, menace that Radcliffe is unable to muster. 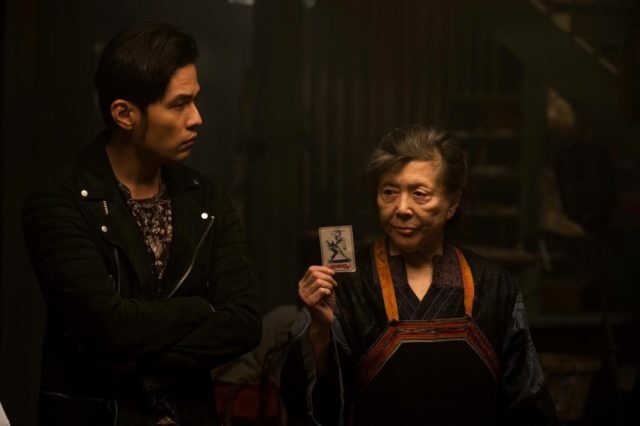 It’s abundantly clear that Chou’s inclusion and the Macau setting merely serves to pander to Chinese audiences. Veteran actress Tsai Chin (not to be confused with the Taiwanese singer of the same name), who plays Li’s grandmother Bu Bu, is a far livelier screen presence than Chou. The film calls upon Caine and Freeman to provide gravitas while not doing very much at all, something the iconic actors do without breaking a sweat. Now You See Me 2 alternates between being supremely entertaining and frustrating. There’s glitz, glamour and eye candy effects work galore, but twist after twist after twist does not a truly engrossing thriller make. That’s the paradox: it does not hold up to close examination, yet invites audiences to do so. Ultimately, your enjoyment of Now You See Me 2 is contingent on just how willing you are to be taken on a ride. You’ll get bamboozled, but you just might have fun in the process. Summary: Now You See Me 2 doesn’t make a lot of sense, but the first movie convinced general audiences that making sense isn’t the goal here. The goal is to entertain while misdirecting, and this has entertainment and misdirection in spades. 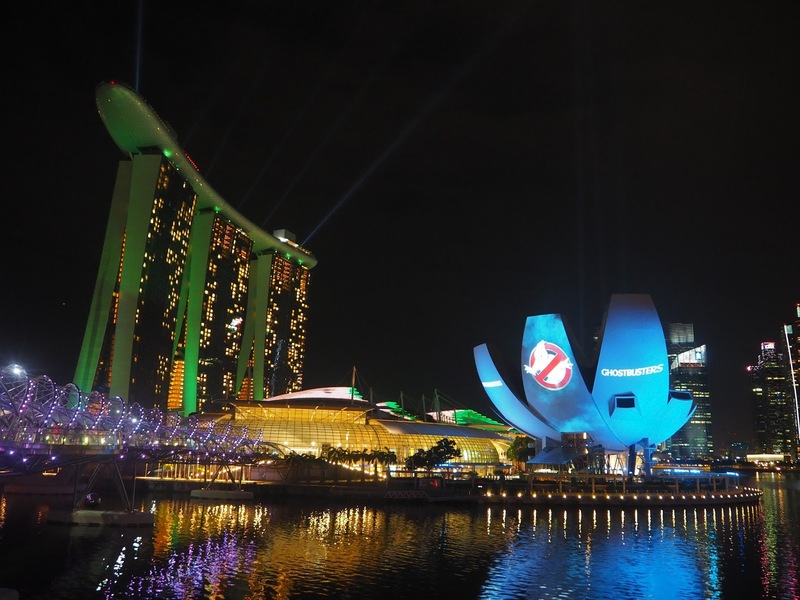 Inclement weather threatened the Ghostbusters red carpet and fan event at the Event Plaza at Marina Bay Sands on Sunday night, but the skies cleared up just in time and fans’ spirits remained undampened. A group of 263 people clad in white hoodies, trousers and masks set a new Guinness World Records title for the Largest Gathering of People Dressed as Ghosts in a Single Venue. Radio deejays Justin Ang, Vernon A, Joakim Gomez and Gerald Koh served as emcees, dressed in Ghostbusters uniforms with inflatable proton packs. 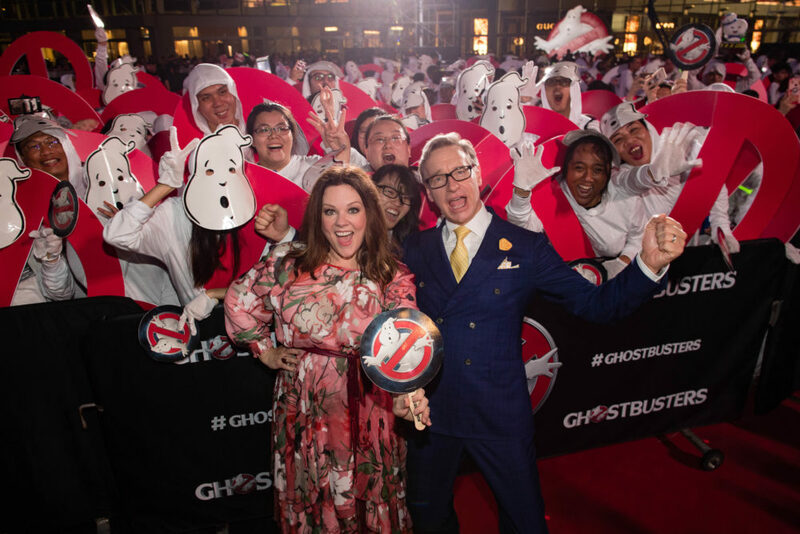 The event was organized by Sony Pictures Entertainment to promote the new Ghostbustersreboot film starring Melissa McCarthy, Kristen Wiig, Leslie Jones, Kate McKinnon and Chris Hemsworth, and directed by Paul Feig. Both McCarthy and Feig were in attendance, greeting fans and signing autographs on the red carpet. The female-led reboot has been met with harsh criticism from long-time Ghostbusters fans, but one wouldn’t be able to tell based on the warm reception McCarthy and Feig received. 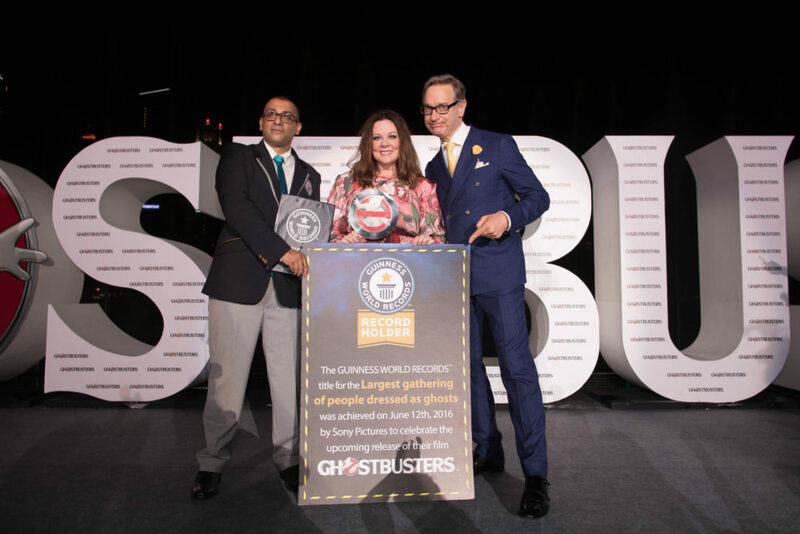 Commenting on this record, Feig said, “Seeing this many people get their ghost on and set a Guinness World Records title is a true testament to this amazing franchise that Dan [Aykroyd], Harold [Ramis] and Ivan [Reitman] created 32 years ago. Fortunately, I ain’t afraid of no ghosts because we were up to our armpits in them. Ghostbusters of the world, gear up!” Feig was accompanied by his wife Laurie on the red carpet. The event kicks off several days of Hollywood glamour as the Sony Summit continues apace in Singapore, with Inferno stars Tom Hanks and Irrfan Khan and director Ron Howard as well as The Magnificent Seven director Antoine Fuqua set to grace the red carpet this week. Ghostbusters opens July 14 2016. Blizzard’s fantasy franchise comprising video games and novels finally makes its leap to the big screen. 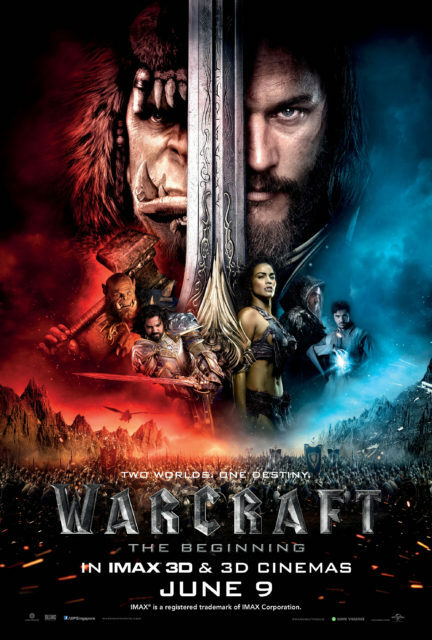 Sir Anduin Lothar (Fimmel), the military commander of the Stormwind Kingdom in Azeroth, faces an unprecedented threat: Gul’dan (Wu), a powerful orc warlock, is leading the orc hordes from their dying homeworld of Draenor into Azeroth. Garona (Patton), a half-orc, half-human woman enslaved by Gul’dan, must decide where her loyalties lie. The noble orc chieftain Durotan (Kebbell), whose mate Draka (Galvin) is pregnant with their first child, does not see the merit in Gul’dan’s attack. At the behest of Stormwind’s King Llane Wrynn (Cooper), Lothar must defend Azeroth from the invaders. Together with young mage Khadgar (Schnetzer), Lothar seeks out the reclusive sorcerer Medivh (Foster), the Guardian of Tirisfal. They must repel Gul’dan’s evil magic, known as the Fel, as the seeds of an ages-long conflict are sown. Director Duncan Jones, who co-wrote the screenplay with Charles Leavitt, weathered an arduous production process and is himself an ardent fan of the Warcraft franchise. The disparity in the reaction the film has received from critics and fans indicates that this does appeal to those already familiar with the source material and who are excited to see the characters and locations come to life in cinematic form, but that those coming in cold will likely be alienated. This is very much a generic high fantasy tale, and there are so many characters introduced from the get-go that it’s easy to get them mixed up. The straight-face earnestness in the approach is a double-edged sword: on one hand, the filmmakers demonstrate a belief in the world they are building, but on the other, there’s an impenetrable rigidity to it all. Jones ploughs dutifully through the plot, but audiences aren’t given a chance to acclimatise to the world and the characters; the story itself is simple in nature but convoluted in execution. Visually, this is an achievement, if not as earth-shattering as some might have hoped. The visual effects work, handled by Industrial Light and Magic and other houses like Hybride and Rodeo FX, is superb throughout. Visual effects supervisor Bill Westenhofer was an Oscar winner for Life of Pi, and one can tell that great care has been put into realising the digitally-created characters and environments. The props were crafted by Weta Workshop, and everything from the suits of armour to the swords to King Llane’s helmet abounds with pleasing detail. It’s a shame then that while perfectly acceptable, none of the designs really set Warcraftapart from its high-fantasy ilk. After boarding the project, Jones set about re-writing the script so that it wasn’t built around the hoary trope of “all the humans are good guys and all the monsters are bad guys”. Fimmel, best known as Ragnar Lothbrok on the TV series Vikings, is a serviceable heroic military commander. Lothar’s relationship with his son Callan (Burkely Duffield) is a key component of the character’s arc, but because it has to make room for everything else, that is severely underdeveloped. Patton exudes confidence and retains a degree of elegance while playing a feral half-breed; Garona ended up being the character this reviewer gravitated to the most. Foster lacks the other-worldly mystique that Medivh should have, while Schnetzer is a fine sidekick to Fimmel. In addition to play the orc chieftain Grommash Hellscream, Terry Notary was also the movement coach for the actors play the orcs. Notary’s credits include Avatarand Rise and Dawn of the Planet of the Apes. The orcs are brutish by nature, and the gentleness with which Durotan holds his new-born son does lend the character more shades beyond that of a fierce warrior. Cooper looks the part of a dashing young king and Negga is plenty regal as Llane’s Queen-consort Lady Taria. Gul’dan is as one-dimensional as villains get: he’s little more than the snarling, hunchbacked wizard with an unquenchable thirst for power. We would offer Wu some praise, but it is hard to find him (or most of the other actors playing orcs, for that matter) in the character, since his voice has been treated in post-production and there’s no resemblance whatsoever. This reviewer feels Wu should be a much bigger star in Hollywood, so it was a bit of a disappointment knowing he’s in this movie but is hardly noticeable. Warcraft is not a total wash, but given the build-up and the massive following the franchise has, it’s a shame that the film carries with it the vibe of going through the motions. Jones is obviously passionate about the property and has filmmaking talent to spare, but the cluttered narrative holds neophytes at bay. It’s hard to shake the feeling that one has been dropped in the deep end of the Warcraft lore pool, when this is meant to be an origin story that builds the world from the ground up. It’s more frustrating than genuinely aggravating that Warcraftstumbles so many times in its would-be epic journey. Summary:For long-time fans of the franchise, this might be a dream come true, but it will be challenging for newbies to make head or tail of the overstuffed story, or differentiate a number of the characters. 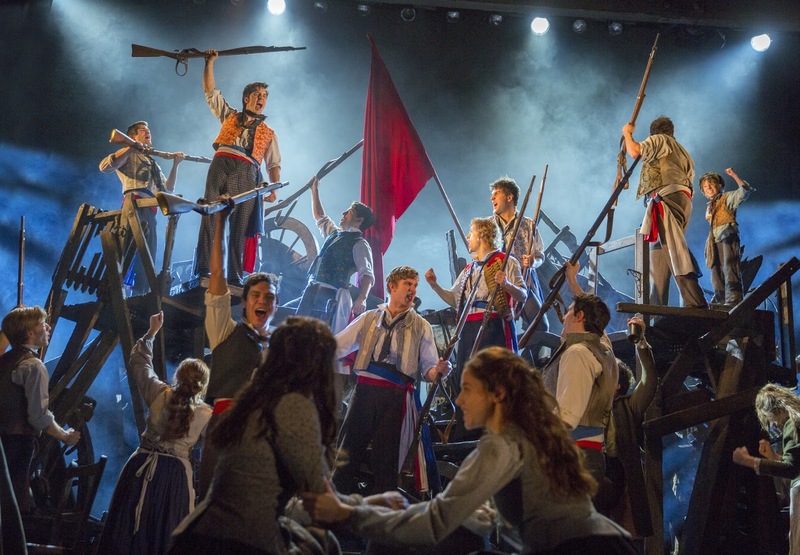 When one thinks of juggernaut musical theatre extravaganzas, the show that immediately comes to mind (apart from the one about a disfigured genius who kills a bunch of people in an opera house) is Les Misérables. Based on Victor Hugo’s 1862 novel, considered to be one of the greatest works of 19thCentury literature, the musical was composed by Claude-Michel Schönberg, with French-language lyrics by Alain Boublil and Jean-Marc Natel. After becoming a hit in Paris, an English-language version with lyrics by Herbert Kretzmer premiered on the West End in 1985 at the Barbican Theatre. Weathering some nasty reviews from the British press, the show has gone on to be a worldwide sensation, with touring productions, translations into multiple languages, anniversary gala concerts and a 2012 Oscar-winning film adaptation. Touring productions have previously visited Singapore in 1994 and 1996. It is 1815, and Jean Valjean is a convict who was sentenced for stealing a loaf of bread to feed his sister’s dying son. Valjean breaks parole to start a new life, eluding the capture of Inspector Javert. Following an encounter with a gracious bishop, Valjean reinvents himself as “Monsieur Madeleine”, eventually becoming the mayor of Montreuil-sur-Mer and a factory owner. Factory worker Fantine gets fired and is forced into prostitution. 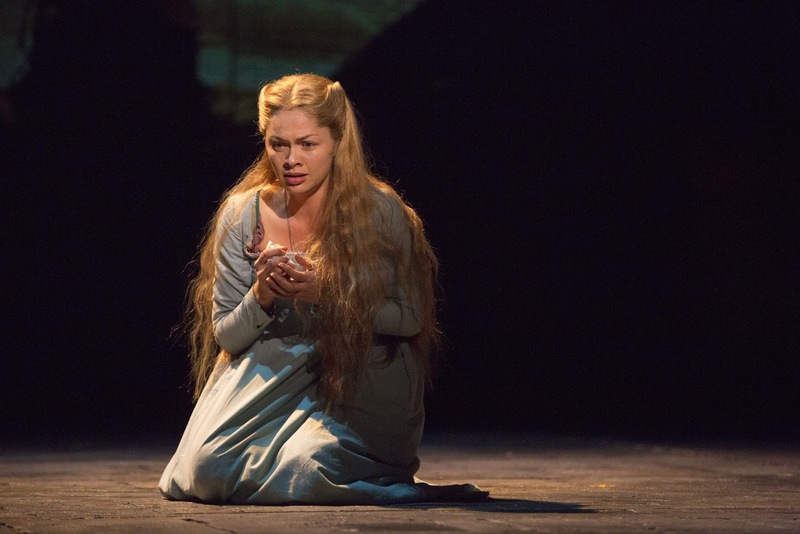 As she lies dying, Valjean vows to care for Fantine’s daughter Cosette. He rescues Cosette from the cruel innkeeper Thénardier and his wife. Years later, Cosette meets and falls in love with Marius, a dashing young student drawn into a rebellion led by the passionate Enjolras. 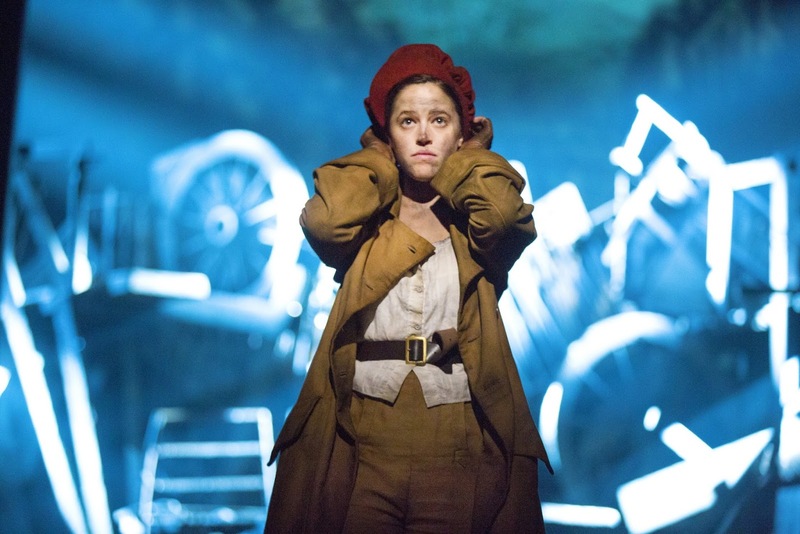 In the meantime, Thénardier’s daughter Éponine pines for Marius but goes unnoticed. Through all this, Javert continues his relentless pursuit of Valjean, whom he sees as no more than “Prisoner 24601”. The show has such an in-built following that one has to remember that for audiences who have had no prior exposure to the story in any form, there’s some legwork to be done. While the lush score and exceedingly memorable songs do sweep one up, it’s clear that even at a running time of 3 hours (including intermission), the story has been greatly truncated. There are two major time skips: the story begins in 1815, then skips to 1823, and then further ahead to 1832. 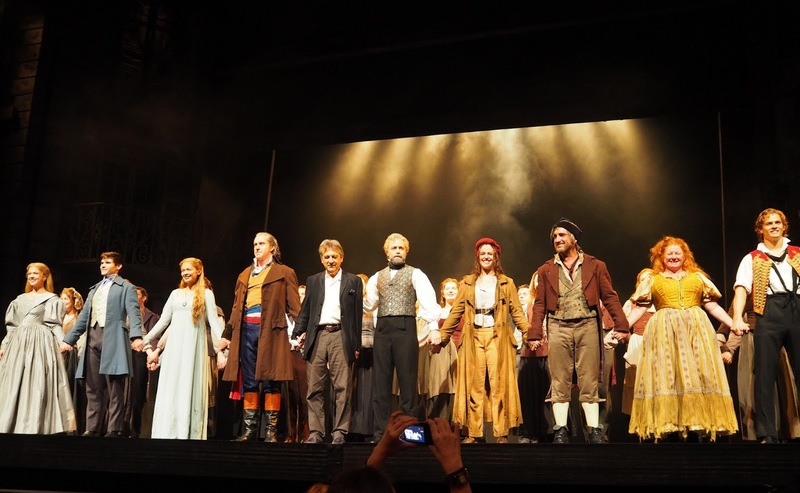 Characters reunite out of what seems like sheer convenience –Thénardier even references the serendipity that fuels the plot with the line “Ain’t the world a remarkable place?”. 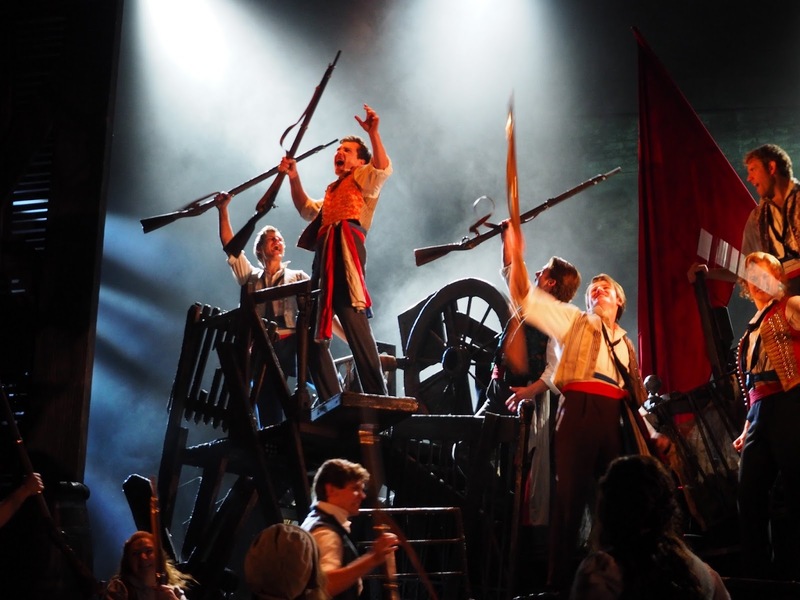 The bulk of the story is set against the 1832 June Rebellion in Paris, but even given spirited speeches from student revolutionary Enjolras, we don’t get all that clear of an idea what exactly they’re rebelling against, apart from vague injustice. That said, this is still a show with tremendous emotional impact, enhanced by big-budget spectacle. This new production, patterned after the 25th anniversary reworking of the show, features set designs by Matt Kinley, inspired by the original paintings of Victor Hugo. Hugo’s paintings are also worked into the projected backdrops. The multimedia effects include splashing water projected onto the scrim in front of the chain gang rowing away in the galley, as well as 3D animation of the cavernous sewers through which Valjean carries Marius. It’s a tiny bit tacky. The set is detailed and elaborate, with hinged flats swinging open to let in shafts of light; Paule Constable’s lighting design always dramatic. The askew back-alleys do look authentic enough, though the stage does often seem cluttered because so much is going on at once. 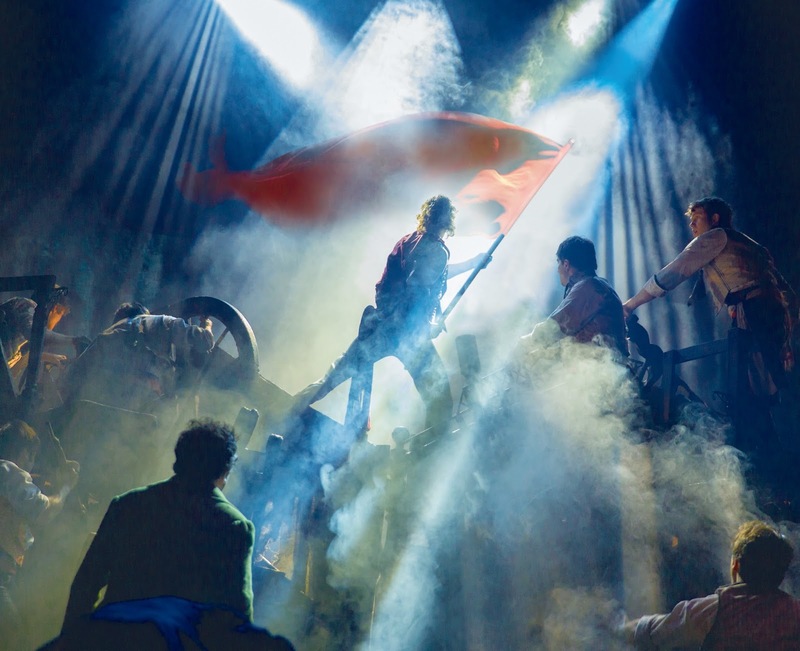 Fans of the original staging might find themselves missing that turntable once the barricade goes up or pining for the way the sewer scene was originally lit, but there’s still no shortage of awe-inspiring visual splendour in this staging. Also, those gunshot effects are wont to give everyone in the first five rows mild tinnitus. 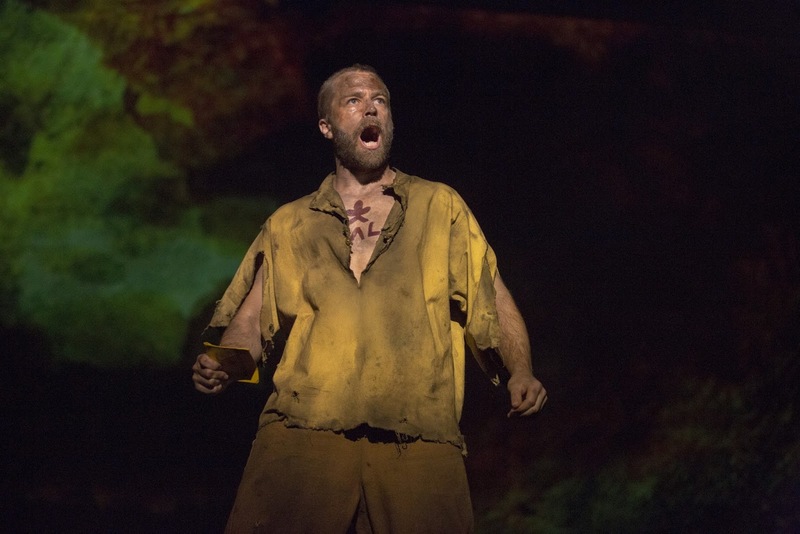 Simon Gleeson’s Valjean is a man who begins as violent and bitter, and through his quest for redemption, never completely shakes that. 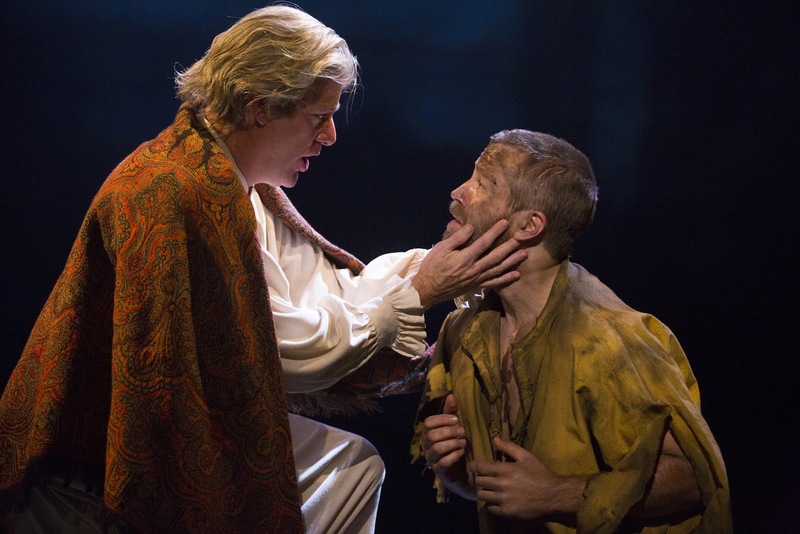 It’s an interpretation that this reviewer found quite compelling, as Gleeson constantly reminds us that the feral beast with nigh-superhuman strength has never really gone away, and that Valjean is a man who has never been at peace with himself. While he delivers Valjean’s Soliloquy with great conviction, Gleeson has a tendency to go a little shouty during the opening act. His take on Bring Him Home, typically thought of as a tender song, is a little angrier than fans might be used to, but it does work with Gleeson’s characterisation of Valjean. Gleeson has, quite touchingly, said that the moment in each performance he most looks forward to is when Valjean meets little Cosette for the first time. One does get the sense that Valjean is valiantly trying to better himself for the sake of his adopted daughter, and the conclusion of Valjean’s odyssey is both satisfying and heart-rending. 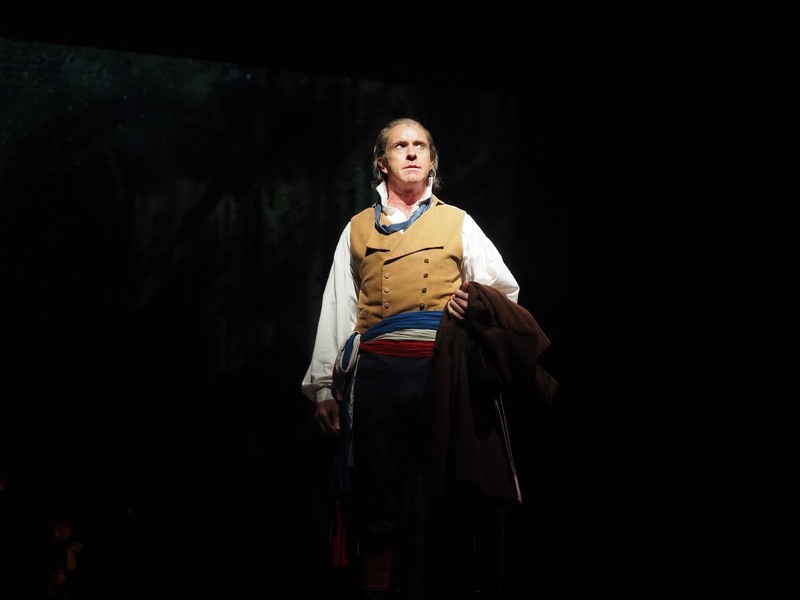 Earl Carpenter reprises the role he’s played on the West End and in other touring productions, the antagonist Javert. The character is driven by a singular obsession and is unwavering in his hunt for the fugitive who has eluded his capture, so it is easy to make him a moustache-twirling villain. 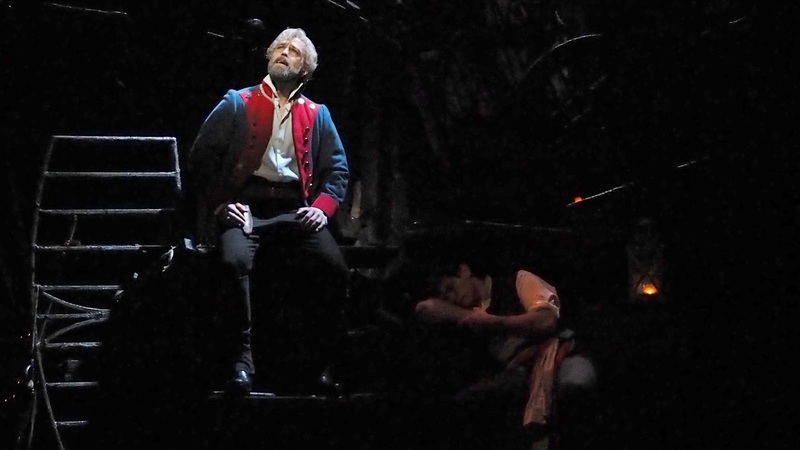 Carpenter stays a safe distance away from that, but his Javert is still easy to root against. The superciliousness and condescension that are vital components of the character are very much present in Carpenter’s interpretation, and the actor’s imposing physical stature certainly helps. 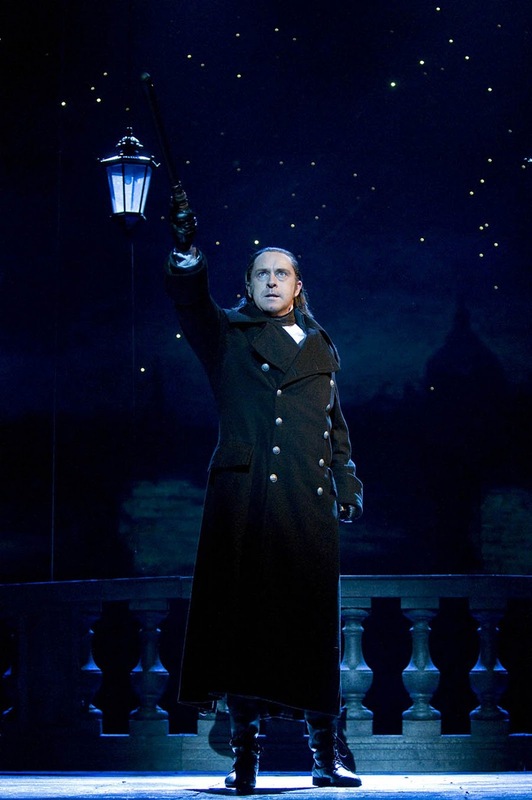 His take on Javert’s signature tune Stars is a genuine show-stopper and is one of the best renditions this reviewer has heard. Patrice Tipoki’s Fantine is perfectly serviceable and her rendition of the iconic song I Dreamed a Dream is a decent one, but she ultimately doesn’t plumb the depths of the character’s tragedy, failing to make enough of an impact in her limited time on stage. Incidentally, her sister Laura is the conductor and musical director for this production. Both Paul Wilkins and Emily Langridge are expectedly pretty in appearance and vocals as Marius and Cosette respectively. The “love at first sight” arc, complete with a meet cute in the town square, will set more than a few eyes rolling. 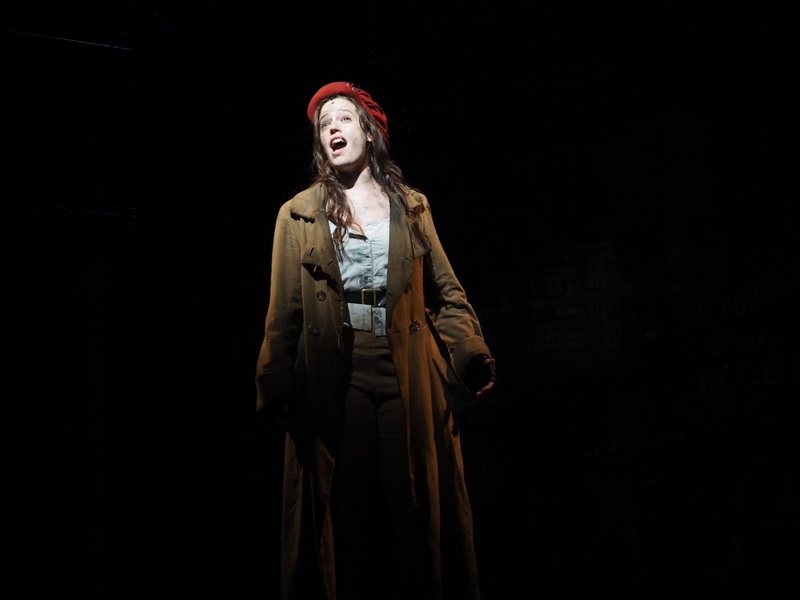 Enter the hypotenuse in our love triangle, everyone’s favourite character Éponine. Kerrie Anne Greenland is plucky and feisty, but is also capable of becoming heart-achingly vulnerable during On My Own and A Little Fall of Rain. Her Australian accent creeps in quite often (listen out for how Greenland sings the word “only”), but it actually adds to ‘Ponine’s charm. She might just be this reviewer’s favourite performer in the show. The designated scene-stealers, Mr. and Mme. 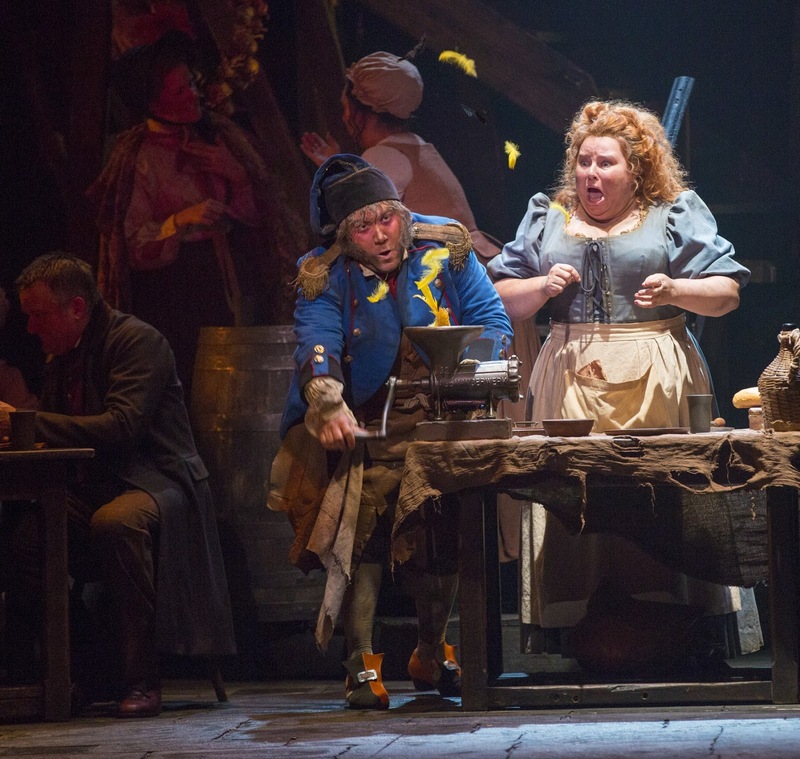 Thénardier, played by Cameron Blakely and Helen Walsh respectively, with great aplomb. The characters provide much of the comic relief in a relatively downbeat show (it’s there in the title), but also have to possess actual malice and make the audience’s skin crawl. Some of the slapstick in Master of the House is a little too silly, but an elaborate gag involving a blind traveller and his pet bird is downright hilarious. We have to laugh at the Thénardiers and also find them utterly despicable; Blakely and Walsh have got all the bases covered. Over at the barricade, Chris Durling imbues Enjolras with great vigour, but did go off-key a few times while issuing his calls to arms. 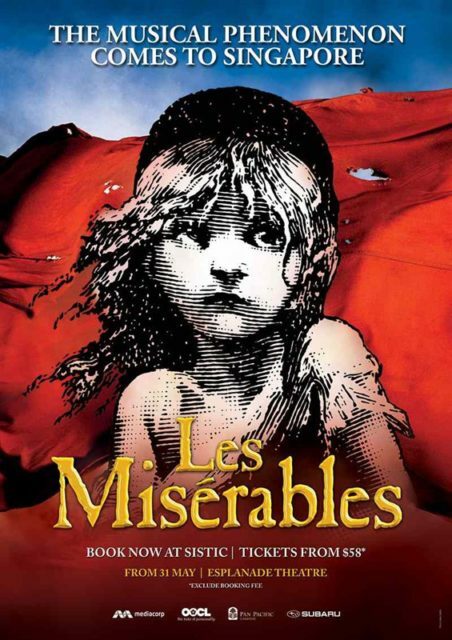 Because of the nature of the 1900-page (in the original French) source novel, Les Misérables might not be a work that’s readily understandable in full, but it is a musical that is easy to connect with. The stirring music, powerful characters and dazzling eye candy stagecraft all make for a thrilling night at the theatre. Despite the long running time, there’s nary a dull moment in this show rife with incident. Rather than pulling one out of it completely, the moments of melodramatics and overall lack of subtlety add considerably to the charm of the show. Those attached to the original staging might bemoan what seems like change for change’s sake, but if you’re experiencing the show for the first time, it will be difficult to resist. Summary: The storytelling is hampered by various practical limitations and some of the changes in this new production are unnecessary, but there’s no denying that this beloved musical remains a visual and aural treat, with powerful performers leading the cast. 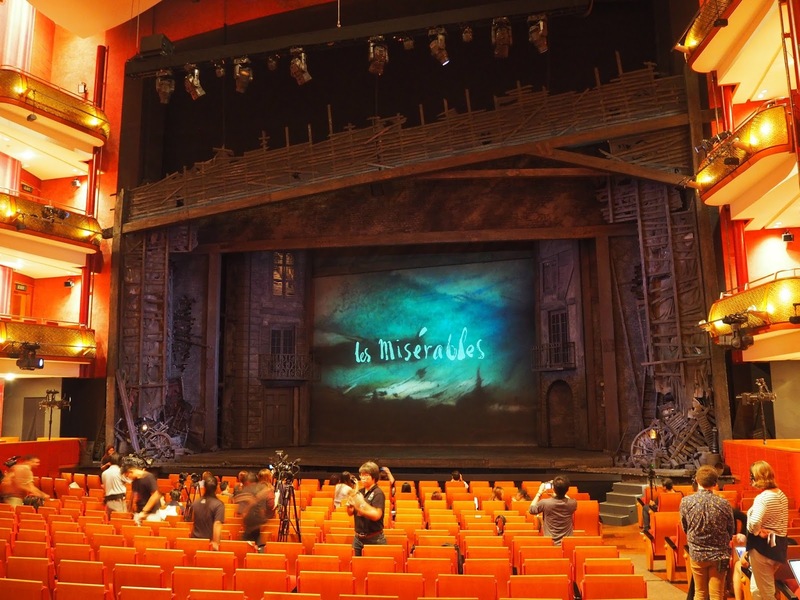 It has been 22 years since the barricades arose at the Kallang Theatre, when the blockbuster musical Les Misérables first arrived in Singapore. Arguably the best-known adaptation of Victor Hugo’s landmark 1862 historical novel, the story is predominantly set against the backdrop of 1832 June Rebellion in Paris. Composer Claude-Michel Schönberg and lyricists Alain Boublil and Jean-Marc Natel’s original French-language musical debuted in 1980, with the English adaptation featuring Herbert Kretzmer’s lyrics opening in 1985. 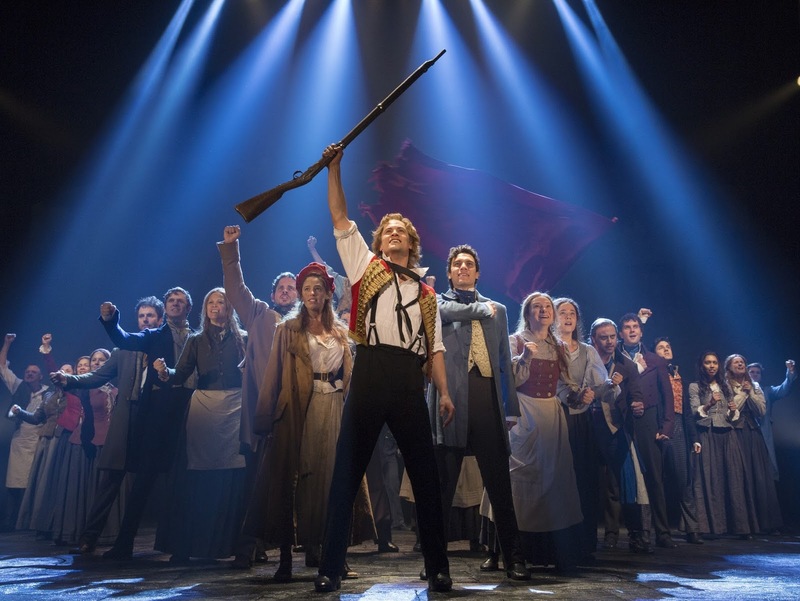 Les Misérables has since become the longest-running musical on the West End, and has celebrated its milestones with all-star anniversary concerts. A feature film adaptation of the musical was released in 2012, winning three Oscars. 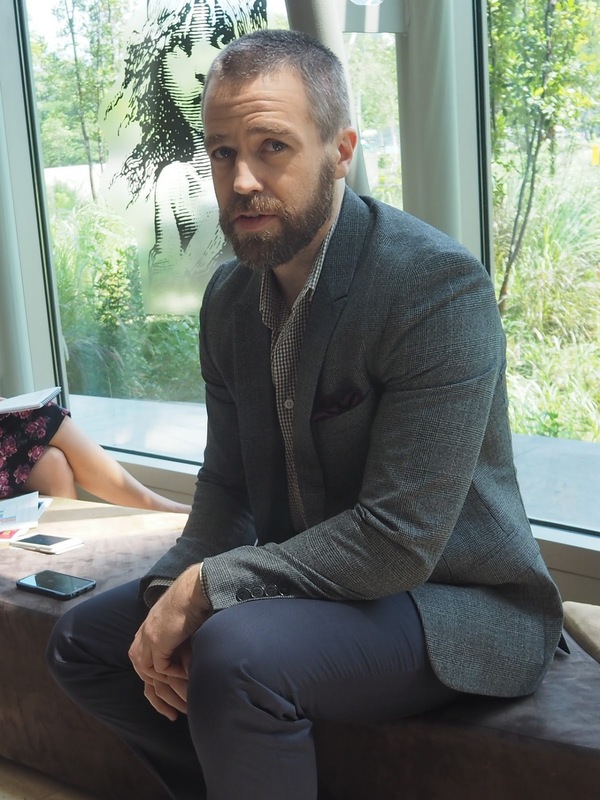 On Thursday morning, F*** was in attendance at the Esplanade Theatre as a press preview was staged, followed by interviews with the cast and crew. This production is at the tail-end of a two-year tour, which began in Australia and is fresh off their Philippines leg. This staging is different from how fans of the original might remember it; the show was reworked for its 25th anniversary with new set designs and a re-orchestrated score. 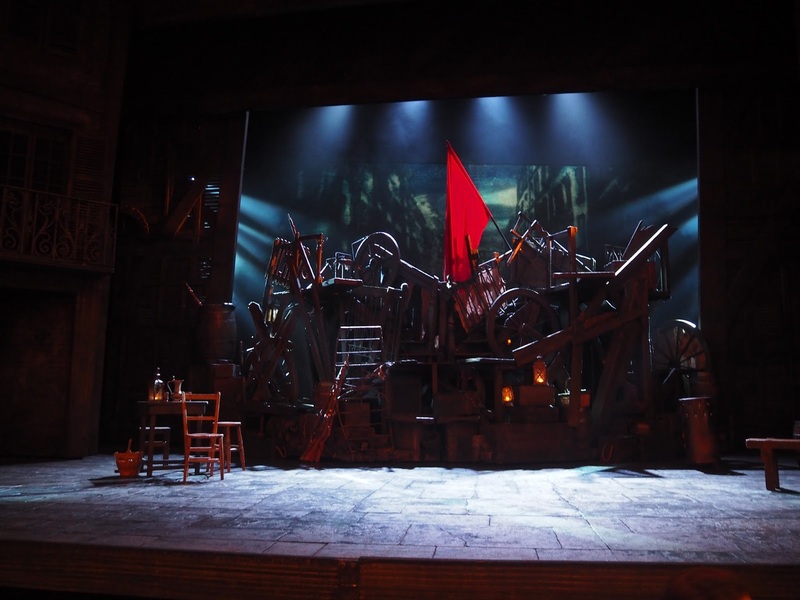 While iconic elements like the turntable and the barricade set that splits in half have been excised, Matt Kinley’s set design takes inspiration from the paintings of author Hugo, who was also an accomplished visual artist. The paintings, projected onto the backdrop, further enrich the depiction of 19th Century France. 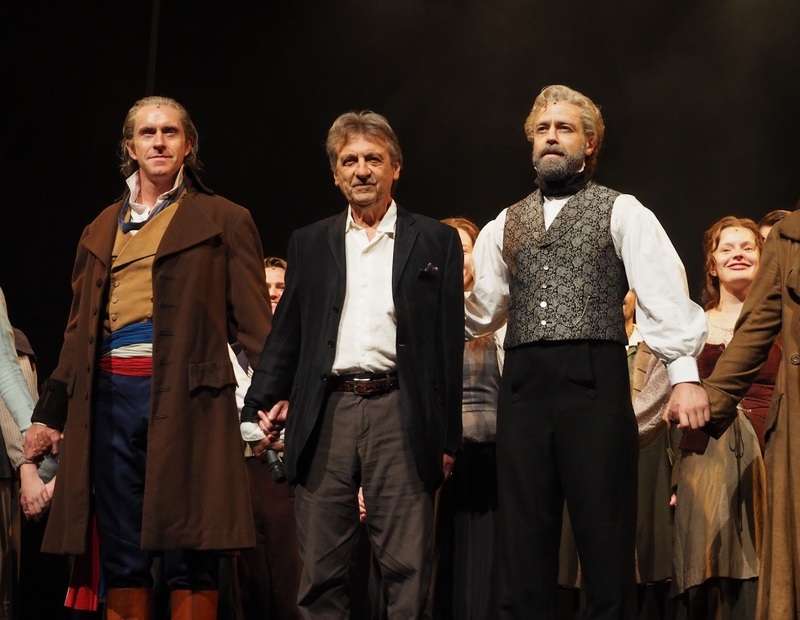 Boublil is of the opinion that not everything makes a good musical, and described how he and Schönberg were convinced of Les Misérables’ potential. “Many of them are musicalized in an opportunistic way, or they don’t last,” he said of other source material. When asked whether or not he remembers the feeling of first seeing the musical on stage, Boublil replied “I remember it very well.” On the cast of the original West End production, which included such luminaries as Colm Wilkinson, Frances Ruffelle and Patti Lupone, Boublil commented “We had the crème de la crème of musical theatre, but we didn’t know it yet! We didn’t know that they would each become a star in his or her own right.” It might be hard to imagine now, but the show opened to scathing reviews on the West End. Boublil remembered a headline in an English daily which read “What can be worse than a bad musical? A French musical.” “That day was like a death sentence is ringing,” he recalled, thinking that the show would surely close inside of a month after those notices. “To my amazement and pride, it has become the world’s longest-running musical,” he said. The part Gleeson most looks forward to during each performance might surprise audiences, since it isn’t the grand solos like Valjean’s Soliloquy or Bring Him Home. 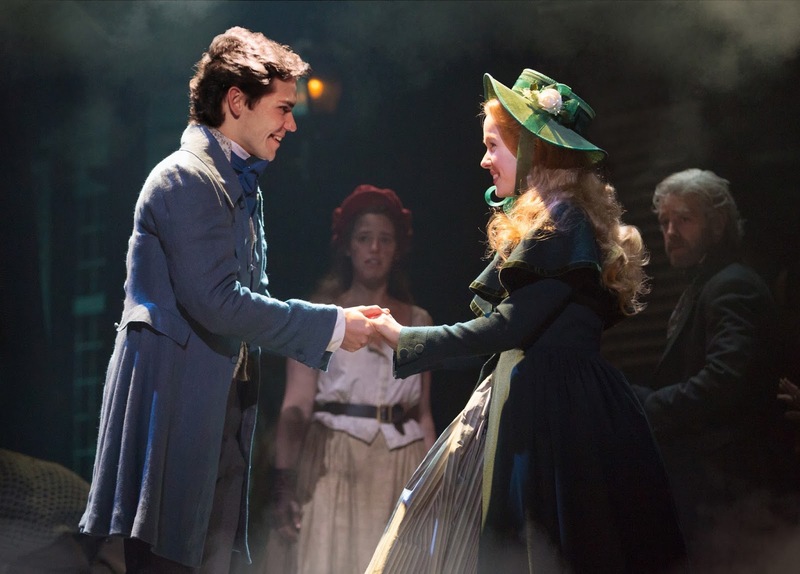 “It’s meeting little Cosette. Meeting the little girl is the first time the character gets to smile. It’s the first time he goes ‘I can live for something now’.” He had quite the heart-warming story to relate about his daughter. “When I first was rehearsing for the audition years ago, I would sing Bring Him Home in the house and she actually said ‘I forbid you to sing in the house’.” Gleeson related to us. “I didn’t realise it was because she would go to her room and cry, because she locked on to the fact that something was wrong, that I wasn’t happy, that I was in pain and something was going on and she couldn’t comprehend it, she understood just from the music alone.” His son’s reaction after watching the show was a little less complicated. “He just liked the guns,” Gleeson chuckled. Greenland added that Éponine might have stood a chance “if she had a bath”. The actors spoke of going back to the source material, since much of the material was cut down in the adaptation process. “Cosette as a character has so much description in the book and in so much detail, where in the musical, her role is scaled down quite a lot, so I really try to get as much detail as I can from the book to give the role the most amount of depth in a short time,” Langridge said. This process was also helpful for the actors in creating something that resonated with them, rather than attempting to replicate past portrayals. Out of all the characters, Fantine, Cosette’s biological mother, probably has the most number of tragic calamities befall her. Fantine sings what is arguably the best-known song in the show, I Dreamed a Dream. Australian actress Patrice Tipoki, who has starred in productions of The Lion King, Wicked and Beauty and the Beast, plays Fantine. She has been a fan of Les Misérables since she was young. “I used to sing Master of the House when people would come to the house, I don’t know how appropriate that was for a seven-year-old girl!” she laughed. “It took a while for me to shake other people’s versions of this song, especially in my head, because I grew up with it,” she said, on the subject of making the role her own. “It was nice to have the rehearsal process that we do to be able to find my voice and my story that I wanted to tell. And of course, that still changes every night, depending on how I’m feeling and how receptive the audience is. It’s nice to know that everyone already loves the song, so it’s starting on a good note.” Fantine’s appearance in the musical, while impactful, is relatively brief. “Every night I go ‘maybe I’ll live tonight!’ It’s never happened yet, still trying!” Tipoki joked. 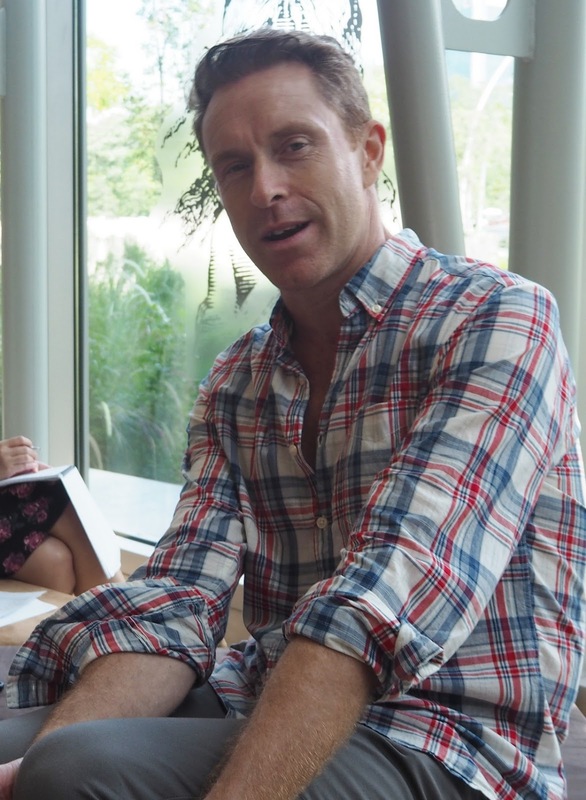 Co-director James Powell explained the lasting appeal of the show, saying “The story itself is about the human condition. It’s a classic story that’s just as relevant today as it was 400 (sic) years ago. The generosity of spirit is what I think people are moved by, in the face of adversity, they come through, and I think that’s what people find very uplifting. And the music helps a bit.” Working for super-producer Cameron Mackintosh has kept Powell on his toes. 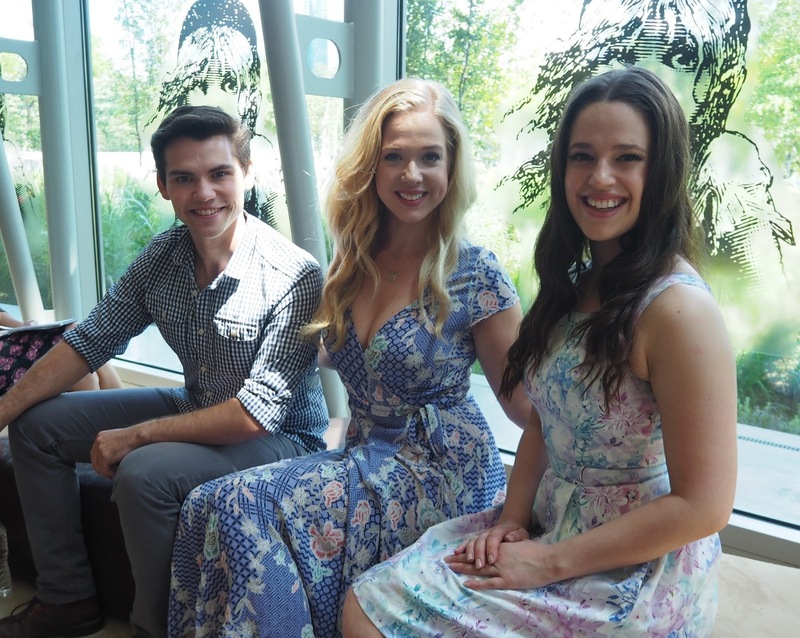 “When you work for Cameron Mackintosh, you are always evolving, you don’t stay still,” Powell said. 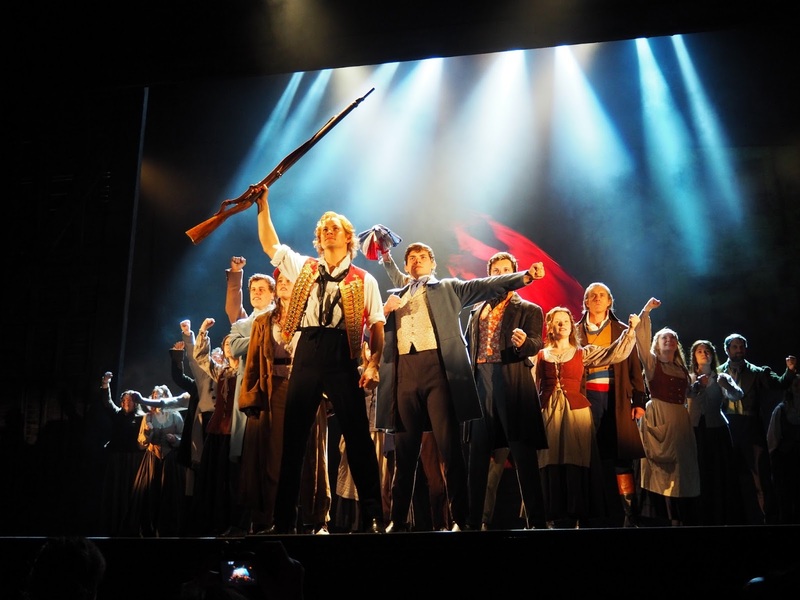 Les Misérables runs from 31st May to 24thJuly at the Esplanade Theatre. Please visit http://www.sistic.com.sg/events/mis0716 for ticket information.